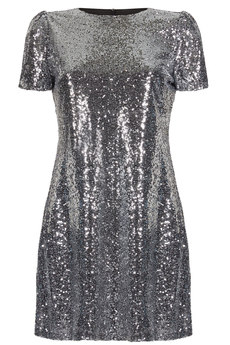 Sequin Embellished Party Dress is the ultimate sparkling dress. Dazzle on the dancefloor perfect for parties and nights out. In a relaxed shape which makes it chic and comfortable is adorned with silver sequins which catch the light like no other. Has concealed zip fastening, it is fully lined, and is approx. 85cm in length. Winter collection. Composition: 100% Polyester. Color: Silver.